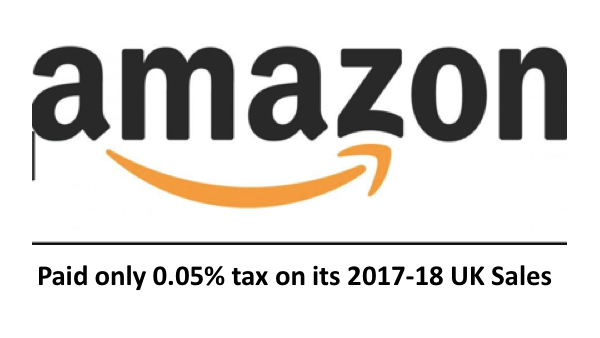 If you look at Amazon’s effective UK tax rate last year, it works out at 0.05%. It does this by basically basing its main sales operations in countries with a low tax rate… it basically ‘sells’ products to it’s UK subsidiary for next to (or probably 0) profit which then ‘sells these on’ for no profit to actual UK customers, hence very low tax. Amazon is basically scamming the global tax system. All of the big four global tech companies are notorious for avoiding tax, but Amazon is by far the worst…In terms of tax paid as a proportion of sales and profits, Amazon is the worst offender of the ‘big four’ tech companies. Amazon paid even less tax than Facebook last year £4.5m on annual UK sales of £8.7bn and pre-tax profits of £72 million. Google has the best tax record – it paid £49.3m in UK taxes last year, on UK sales of £5.7bn, on pre-tax profits £ 202.4 million. I’m not going to comment on Apple here, because I think its figures might be distorted by its paying historical taxes in the last tax year which it failed to pay in recent years, following a recent HMRC investigation. This example goes to prove the power of Transnational Corporations compared to Nation States. Where money is concerned, large global companies can easily avoid national taxes. This form of economic globalisation seems to suggest the decline of the nation . state! Combatting this would take global co-operation, but it would require the vast majority of companies to agree… all it takes is .a handful of ‘rouge tax havens’ and any co-operation falls apart! It’s one of the many challenges in a global age! Previous post: Why do universities make unconditional offers?